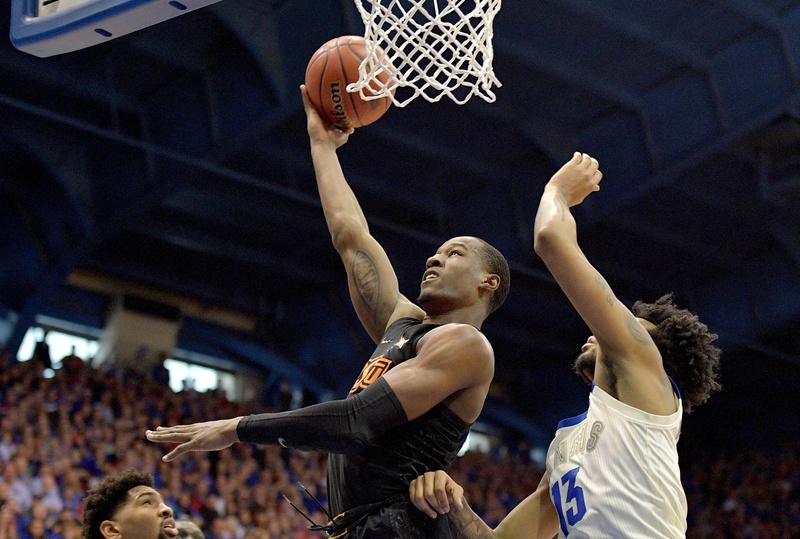 A late barrage of 3s pushed KU past Oklahoma State. A shorthanded and outmanned Cowboys team fell to a slightly less shorthanded Jayhawks team on the road. Bill Self, who started four freshmen, is down a handful of starters so far this year. Mike Boynton would love to have his personnel problems. The final score would tell you otherwise, but it was a tight contest for most of the game. From the tip, it was a back-and-forth slugfest inside the Phog. Cam McGriff and Lindy Waters led the way for OSU in the first half with 11 and 10 points respectively on 11 combined shots. Thomas Dziagwa hit the equalizer 3 late in the first half, and a steal gave Isaac Likekele the opportunity for the walk-off go-ahead shot before intermission. He got his man in the air on the pump fake, but the shot rimmed out. It was 36-all at the break. The Jayhawks came out of the intermission on a 6-0 run, pushing it to 42-36 and matching their largest lead, but Crime Dog had other ideas. After staying within striking distance for 30 minutes on the floor, the Cowboys’ short bench and tired legs betrayed them. A scoring run fueled by the Rock Chalk faithful is daunting for any team. When you’re an Oklahoma State squad with a six-man rotation, it’s insurmountable. Three Kansas 3-pointers in 1:19 of game time turned the tide. Midway through the final frame, Quentin Grimes hit from deep, making his first shot in four tries, to push the Jayhawks’ lead to 8. Then he made another one. Next, Ochai Agbaji made his fifth 3 of the game and all of the sudden KU was on a 12-0 run and up 14. When it rains in Allen Fieldhouse, it pours. And the Jayhawks continued to pour it in from deep making 6 of 15 from beyond the arc in the second half and the Cowboys quickly found themselves out of the game. McGriff shows up big in Lawrence. He followed up last year’s 20-point effort in a win, with this year’s 22 points in the loss. Despite fouling out with just over four minutes to go, McGriff led the Cowboys with 22 points on 7-of-14 shooting and he grabbed six rebounds and two steals in 32 minutes. Up Next: The Cowboys are back home on Wednesday night when they host No. 18 Texas Tech at 8 p.m.